So, I thought I was the only vegan/almost-vegan/vegetarian blogger obsessed with making dessert right now, but I have come to realize that with the heat of summer, I am not alone. I follow many plant-based dieters on social media and I see two popular desserts surfacing over and over again: cheesecake and ice cream. Obviously, these traditional dessert names can be deceiving as there is no cheese in a vegan cheesecake and no cream in vegan ice cream, but you get the idea. Those in the plant-based world are finding healthy, natural, and creative ways to mimic the qualities we have come to love in dairy products. This is not to say that the flavors and the textures are exactly like those of the animal-based variety; they are, however, rich, decadent, just as a satisfying, and most importantly, much healthier. The second mock ice cream title does appeal to me, however, in its description of the ice cream base: bananas. 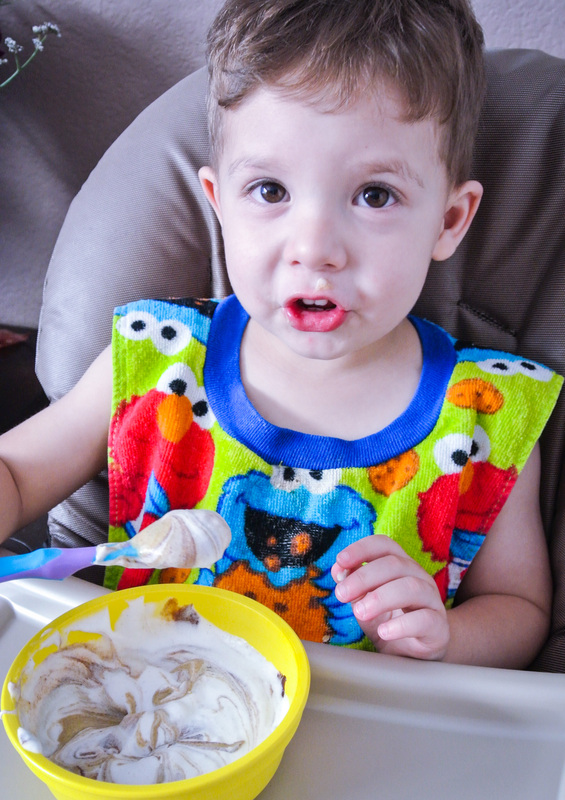 That’s right: our nice cream gets its creamy consistency from frozen bananas. Good news is if you’ve mastered my dessert smoothie formula (this one is very similar), you’re ready to make nice cream! Less liquid + more chunky ingredients topped with chocolate sauce and whipped coconut cream will allow for more of a sundae experience, whereas the smoothie mimics a milkshake. 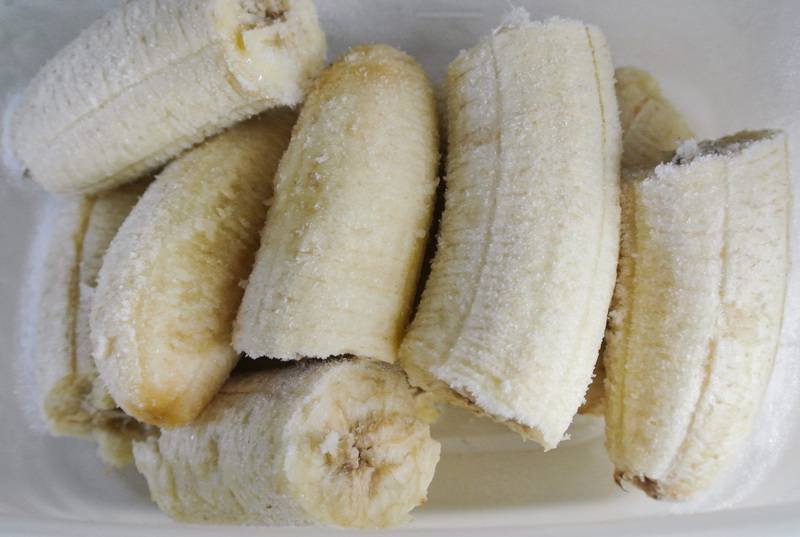 In order to be ready to make nice cream (or dessert smoothies) any time, I peel and chunk ripe or overripe bananas to keep in the freezer. I would highly recommend having a couple chilling at all times, but this is a great strategy if you have a few bananas that are on their way out and you don’t think you’ll eat them in time. (If I don’t pop overripe bananas in the freezer, I quickly whip them up into a batch of my super food muffins). Today’s rendition features one of my favorite nuts: the pistachio. It’s amazing green color not only represents so much of what I stand for in life (plant-based living and the Michigan State Spartans, to name a couple! 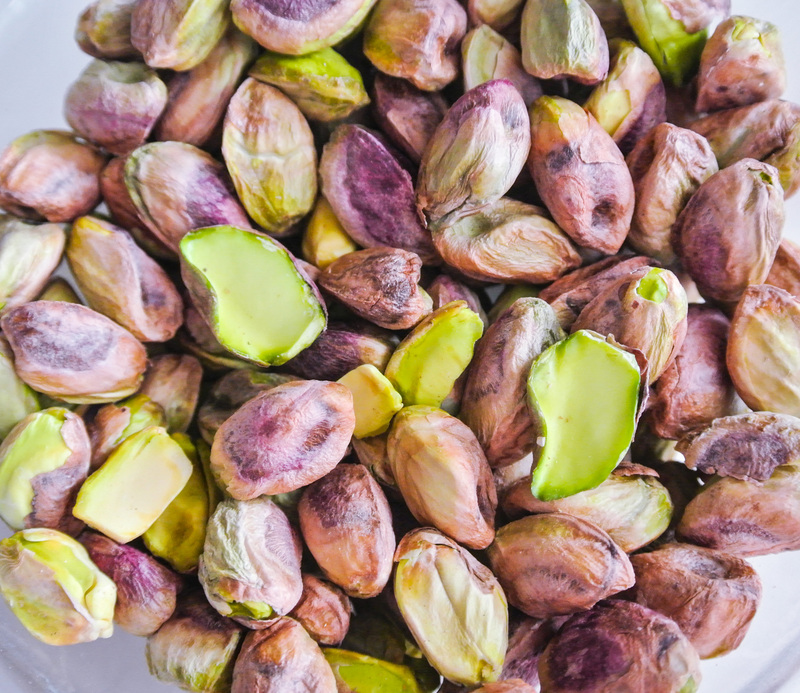 ), but it signifies that pistachios are loaded with antioxidants. They are also a rich source of fiber, vitamin B6, copper, and manganese. Nuts are among my favorite super foods! 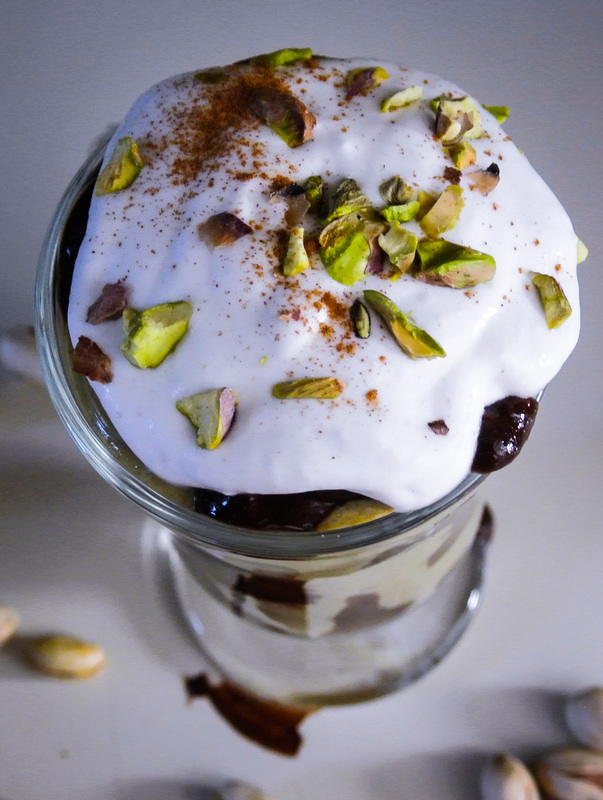 ¾-1 cup specialty ingredients –> I’m using ¾ cup unsalted pistachio meats + ¼ tsp cinnamon. ¼-½ tsp extract of choice (optional, and amount depends on flavor intensity) –> I’m using ¼ tsp almond. Pitted medjool dates as needed for sweetness –> I’m using 2. Juice or plant milk until desired consistency (start with just a splash) –> I’m using almond. ¼ cup extras for mixing in by hand (optional) – think nuts, dried fruit, chocolate chips, etc. –> I’m using more unsalted pistachios, finely chopped. 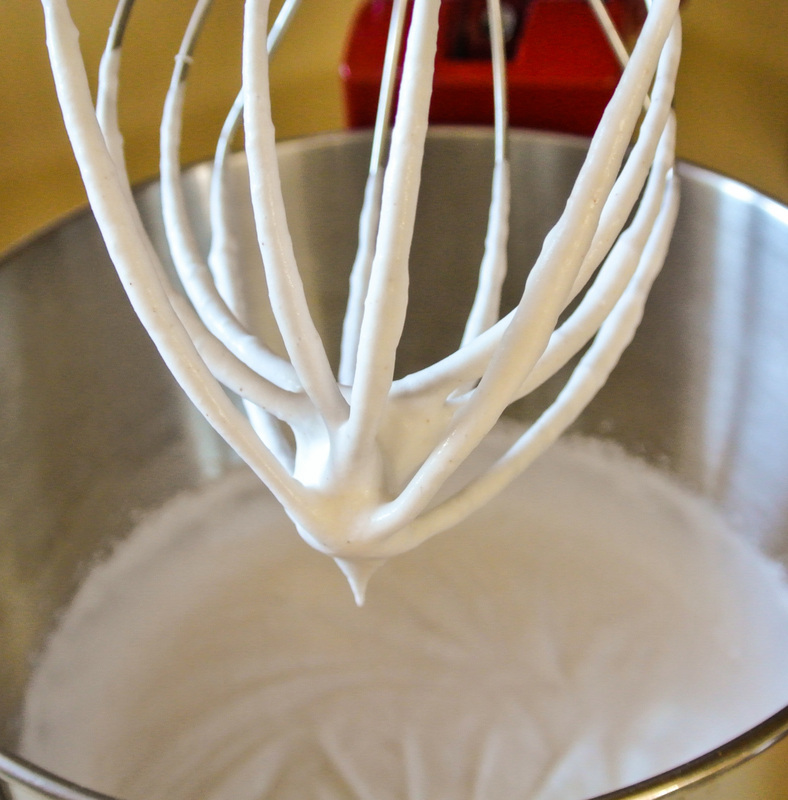 If you plan to make whipped cream to accompany your nice cream, place a mixing bowl in the fridge to chill while you prepare the other components.Combine all ingredients (except the extras) in a blender or food processor and puree until smooth. Scoop the mixture into a bowl and fold in any extras you are using by hand. Cover and place in the freezer while you prepare your toppings (if any). Your nice cream base will thicken in the freezer. ½ cup plant milk –> I’m using almond. 3-4 pitted mejool dates (depending on size) –> I’m using 4. Combine all ingredients in a blender. Pour into a sauce pan on the stovetop over medium high heat. Bring to a boil and then reduce the heat to medium low. Simmer for about five minutes until sauce has thickened slightly. Cool to a palatable temperature before serving. Leftovers? Store in a glass container in the fridge. Heat and add additional plant milk (if necessary) to thin out when using again. 1 can coconut cream or full fat coconut milk –> I’m using cream. Powdered sweetener to taste (start with ¼ cup) –> I’m using ¼ + 1/8 cups powdered turbinado sugar. ¼-½ tsp extract (depending on flavor intensity) (optional) –> I’m using ¼ tsp vanilla. 1 pinch-¼ tsp spices (optional) –> I’m using a healthy pinch of cinnamon. Chill your can of coconut cream/milk in the fridge overnight. After your nice cream is tucked away in the freezer and your sauce is cooling, remove your chilled mixing bowl from the fridge. 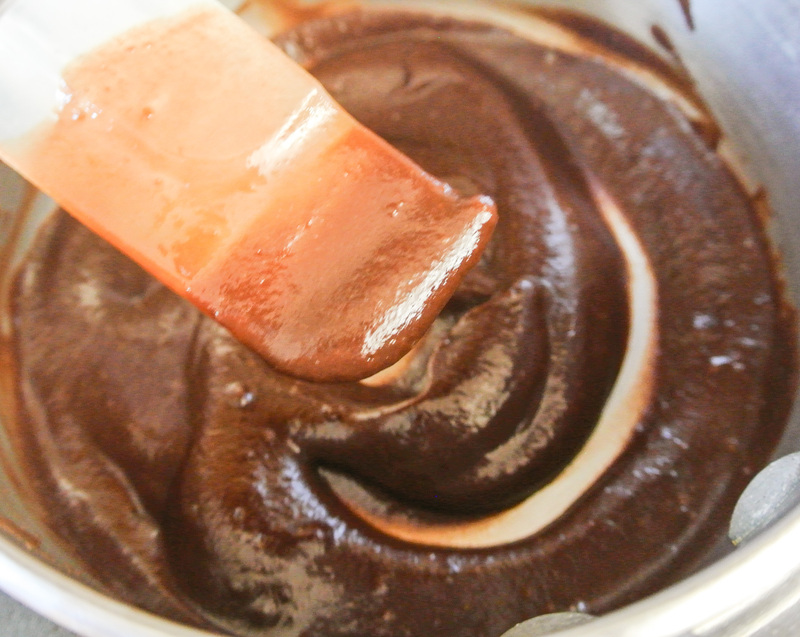 Empty the can into the bowl and whip with a hand or stand mixer until smooth and creamy, about a minute. 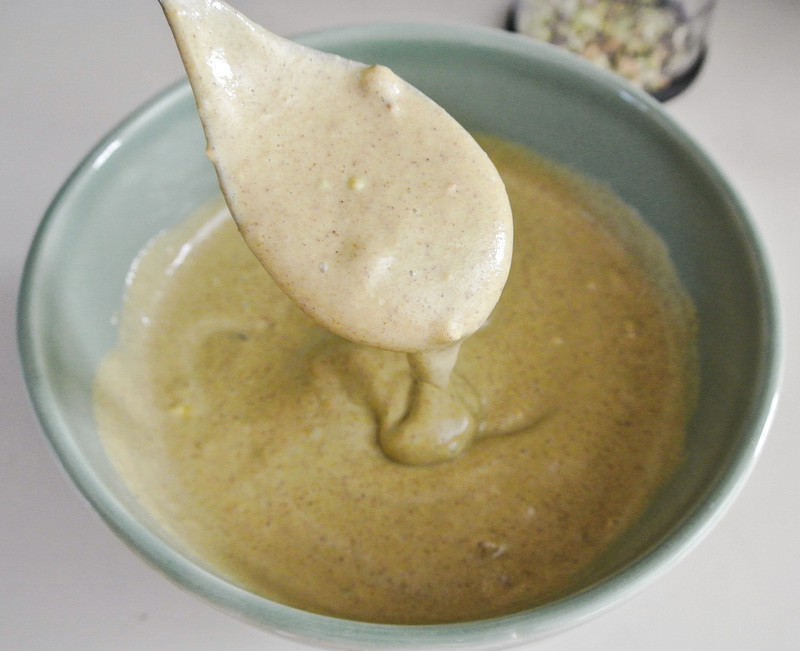 Add sweetener (and extract and spices, if using) and continue whipping until smooth and fluffy, about 3-5 minutes. This whipped cream will not quite achieve the height and stiffness of dairy whipped cream, but it will become a bit fluffy nonetheless. Store any extras in the fridge.